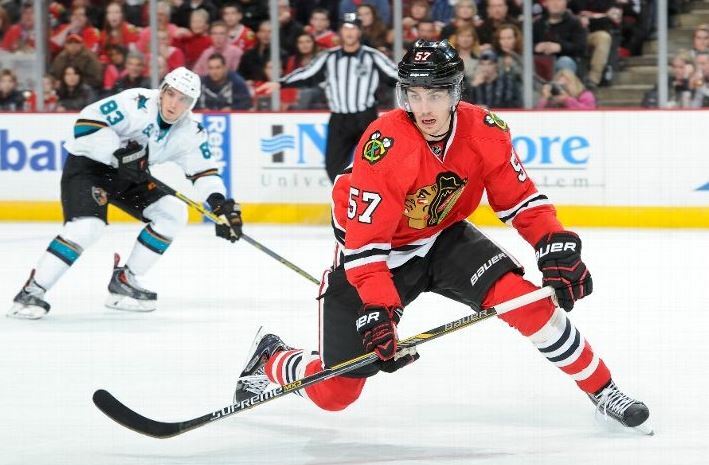 According to a report from ESPN Chicago on Tuesday, Blackhawks rookie defenseman Trevor van Riemsdyk will miss “two to three months” with a lower-body injury. van Riemsdyk’s college career was cut short by a left ankle injury at the University of New Hampshire last season; he missed the team’s final 15 games. I suppose that’s good news? The ACL theory seemed odd from the get go. I wonder if the 2 are somehow related and if it might become a problem moving forward. Once he’s ready to come back it might be a stretch that he’s back on the Hawks. I think he’d finish the year with the Hogs. This is as good as news as can be after preparing for the 6mth acl (12-18mth full recovery range) thoughts I had from hearing about the ticket holders news. Riemsdyk is not out for the season. I will say this again. Believe it or don’t. I was told by a fellow ticket holder who is chummy with a lot of people within the organ-I-zation that TvR tore his ACL and would be undergoing surgery at Northwestern Memorial Hospital in Evanston after a few days to allow the swelling to go on. Perhaps that report is garbage. Or perhaps instead the “semi-news” coming from the Hawks is a load of crap in keeping with the league policy of being very vague. If it is ACL surgery then he is done until next summer. I guess we shall see. I am rooting for the kid and hope it is nothing more than an ingrown toenail. If he was struck by a puck, in a non-protected area, I would assume that his injury is more fracture related. It would be hard to tear an ACL from a direct blow as these usually occur during “torque” or “twisting” actions. 2-3 months would be 8-12 weeks which is usually the healing time for a tibial plateau fracture or any tibial shaft/femoral fracture. My two cents? Just glad he is coming back. Rufus, I did believe the info you said from people from the ticket holders. That is why I was preparing for the 6mther and was relieved with the report of 8-12wks. I did (also however) have that thought in the back of my head, is this just a coverup/no need to announce anything else now. Seems silly to me that the Hawks won’t specify what the injury is. If he were day-to-day and the team did not want an opponent to know( such as the playoffs ), I completely get that. But if he’s gone for a few months, what’s the harm in saying he has a broken foot, or a broken bone in his leg ? ?